This place is insane. I came here with nearly no plans. I haven’t done a ton of things on paper, but I my days have been packed from 10AM until 2AM. I’ve made a habit of befriending strangers, and it’s worked out well. The funny thing is that most of the people I’ve met are New Yorkers. Anyway, onto the lessons from SXSW days 1 & 2. I’ve spoken with a ton of people, and only three of them were here without some sort of business agenda. 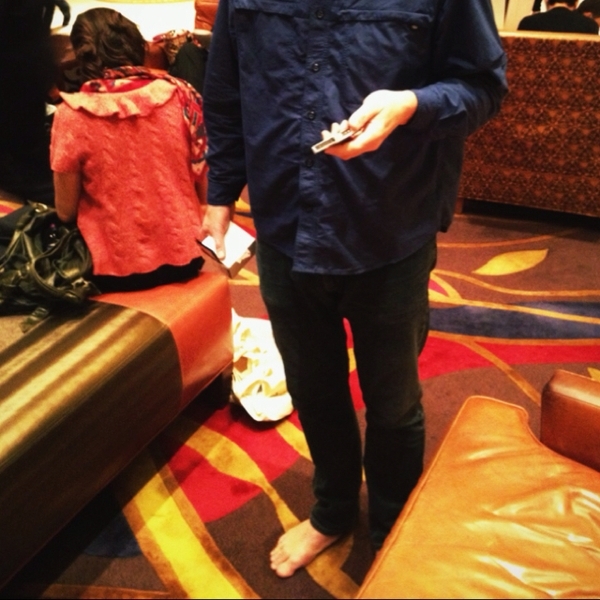 Two were film fans (each traveling alone so they could watch whatever they wanted), and the third… He was walking around a busy hotel lobby barefoot. I assumed that he was doing so to grab attention (like most of the people in costume), but he was just a guy who dislikes wearing shoes. Casino El Camino – Thumbs down – This dive-bar / burger joint is highly overrated. When you walk in, it’s like stepping into a ZZ Top song. It’s the dive bar to end all dive bars. The food was ok, but it took us an hour to get our burgers. They were good, not great, and not worth the wait. The Old Pecan St. Cafe – Thumbs up – I am actually sitting at this one as I write. It’s the second time I’ve been here. It’s a bit pricey, but the foods very refreshing. Iron Cactus – Must visit – I went here twice as well. This tex-mex restaurant is amazing. The Pollo Relleno is a chicken breast stuffed with cornbread and cheddar, topped with a jalapeño cream sauce. Bring your eating belly. The portions are huge. I walked around to some of the larger brand booths to do some research for clients. While I learned a bit, I found the knowledge of the people running the booths severely lacking. ISIS, Pepsi, & AMEX all disappointed when it came to answering questions about the technology that they had on display. There are venues where I don’t bother asking for details, but I’m shocked that these brands didn’t bother to take the geeks out of their caves for the interactive convention. I can’t possibly be the only person at SXSW asking about data security or generally how the hell their stuff actually works. The people at these booths weren’t devoid of knowledge. This isn’t “booth babe” bad, but it’s clear that the people I spoke to didn’t have any specialized knowledge, and there wasn’t anyone at the table to provide specialized backup. Whenever the opportunity presents itself (which is often), I’ve been trying to get to know as many people as possible. I started out walking up to strangers, and then stumbled upon a scheme that was as comfortable as it was practical. I parked myself at a big chair in the middle of the Hilton lobby. The Hilton is right next to the convention center, and is just as much part of the conference as the center itself. There was a chair adjacent to me, and whenever anyone sat in it, they were in for an interview. I’ve learned a lot, and meet tons of great folks.